Alisa is a Hip Hop student at TDF who continues to improve week after week. She is a very dedicated dancer in and out of the studio. Alisa picks up choreography very quickly and always practices her dances at home. She has been a great leader and a positive example for peers in class. We love her spunky personality and can't wait to see her shine on stage at recital! Emily is a standout student here at TDF! Her eagerness to learn and try anything is so apparent in class and we love teaching her something new. While at first she may be shy she is quick to pick up, perform and dance BIG! Her teachers love how well behaved, enthusiastic and funny little Emily is and her joy for anything DANCE. She is kind and respectful of her peers and her laugh is contagious. She has already learned so much we can't wait to see what this peanut can do in the next few years. ​Ayanna is such a wonderful student here at TDF and we are so happy to have her as a member of our Dance Family! She has made a ton of progress with her Ballet Training and Dance Terminology and is a dedicated hard working student in all of her classes! Her teachers love her sweet demeanor, eagerness to learn, and her joy of dance! She is supportive of her peers and is never afraid to try something new! Ayanna is always pushing herself to become a better dancer and we are so excited to see her on stage at recital! Thea is a member of our little Nugget Team here at TDF and we love having this cutie in the studio with us! She is working hard in all of her classes and is fearless when it comes to mastering new skills in Acro! Thea's laugh is infectious and all of her teammates adore her fun loving personality. She lights up the stage with her smile and sass and we can't wait to see her compete this season with her team! Kassidy is enjoying her first year at TDF and is always full of cute giggles and a positive attitude! She is a delight to have in class, always willing to try something new whether it's Cartwheels down the Acro mat or sautés in Ballet Class. She has a blast with all of her dance friends but still manages to be attentive and practices all day long! We are so proud of her! Ava is shining bright at TDF this year! This is her first season with us and she is too adorable for words! She is learning so many new skills and is never afraid to try something new, even if that means tumbling in acro class! Ava is full of laughter and energy but still manages to be a great listener in class despite being so young. All of her teachers are loving having her in class and we can't wait to see her light up the stage at recital this year. ​Congratulations to Malia Monsini- Alves! This is Malia’s first year at The Dance Factory and she is shining! Malia continues to grow every class and is never afraid to ask questions or try something new. Her passion is clear and she comes into dance excited to learn every week and she even practices her moves and vocabulary at home! She is a joy to watch dance and we are so excited to see her continue to do great things throughout the year! This is Noel's very first year at TDF and we are thrilled to have her as part of our Dance Family! Noel is a member of our mini competition team and she lights up the room with her fun loving and enthusiastic energy. She is quick to pick up combinations and skills and we are amazed by how far she has come in just a few short months! Her silly care free personality is so fun to be around and we love having her in class everyday. Ally is a hip hop student at the Dance Factory who has improved greatly since the beginning of the year. Her positive attitude and uplifting spirit are a joy to have in the classroom and influence many fellow students. She is always focused in class and remains a hard worker outside of the studio by practicing with her friends. Ally is always laughing and constantly smiling. Her attitude towards hip hop has made her an excellent dancer and a dedicated student who we look forward to seeing improve even more! No matter what, she never stops trying and working hard! ​Bella is a member of the TDF Novice team. Her efforts in and out of the studio have made for impressive improvement in her dancing this year. Although Bella's flexibility is her forté, she has worked very hard on strengthening and precision this dance season. Her dedication to dance is inspiring for her peers and admired by her teachers. We just love having Bella's positive, eager energy in the studio every day, and love watching her shine on stage! ​Congratulations Bella, keep working hard! Delia is such a hard working student and we just love having her in class! Throughout the year Delia has been working very hard on her posture at the ballet barre and her flexibility. She is very focused and detail oriented, and always asks insightful questions during class. Her dedication to her training and thirst for knowledge has made her a standout for this year! We are so excited to see Delia continue to grow and grace the stage at the TDF recital this year. Congratulations Delia! Vanessa is a member of our Novice Competition Team. It is her first year dancing here at TDF, and we are thrilled to have her! Vanessa is never afraid of a challenge and loves learning about how to improve her dance technique. Her powerful leaps and bright smile are a fantastic addition to the team. Vanessa is always focused, applies her corrections immediately, and is warm and kind to everyone in the class. We are so excited to watch her continue to grow here at TDF! Congratulations Vanessa!Vanessa is a member of our Novice Competition Team. It is her first year dancing here at TDF, and we are thrilled to have her! Vanessa is never afraid of a challenge and loves learning about how to improve her dance technique. Her powerful leaps and bright smile are a fantastic addition to the team. Vanessa is always focused, applies her corrections immediately, and is warm and kind to everyone in the class. We are so excited to watch her continue to grow here at TDF! Congratulations Vanessa! Lila is a member of our Mini Competition Team and is such a joy to have in class. She is a burst of energy on stage and never ceases to entertain her audience! Lila has been super focused in her classes and as a result her Ballet Technique has improved tremendously this year! This is Lila's second year on team and she has always been a supportive fun loving student who just LOVES all things DANCE! Her sassy confidence on stage is something you just can't teach and we are so excited to watch her this season! ​Sophia is a member of our Nugget Competition Team and is doing so well this year remembering all of her choreography! She is super focused in all of her classes and has improved so much in such a short period of time. Her acrobatic tricks have in particular gotten so much better and she now has her front and back walkovers! We love having this silly, adorable and well behaved little one in all of our classes and we are so excited to see her perform at her first competition in a few months! Ava is a member of our Novice Competition Team. Ava has improved tremendously this year, especially at the Ballet Barre. She is a very dedicated dancer and is working very hard in each of her classes. Her teachers love watching her growth in class as she takes on new challenges each week. Always eager to learn a new step, Ava’s enthusiasm has become an integral part of the team. We can’t wait to see her light up the stage this year! Congratulations Ava! Nora is new to TDF this year and we just love having this petite dancer in our class! Nora is the cutest little dancer who is always working hard and listening to her teachers intently. She is thriving in our Acro class this year learning new tricks like her front limber and one handed cart wheels! Her laugh is contagious and her bright and bubbly personality light up the studio. We are so proud of her and can't wait to see what the future holds for her at TDF! Congratulations to Nora! Emma is a member of our Novice Competition team. Year after year, Emma continues to work hard in each and every dance class she takes, to improve her technique and performance ability. She always comes to class prepared, remembering her choreography and corrections from the previous class. 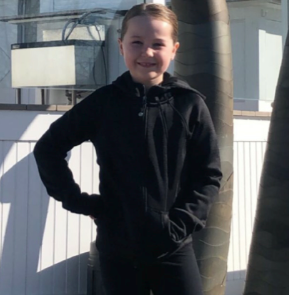 Although very focused and hardworking, Emma’s bubbly personality and wonderful sense of humor really light up the dance studio for both her teachers and her peers. She is a fantastic leader and sets a positive example for the other dancers in the class. We can’t wait to see Emma bring her talent and personality to the stage this year! Congratulations Emma! Celia has been dancing at TDF for two years now and she has grown so much as a person and also as a dancer in such a short time! She is always the first to ask a question in class and is a very respectful and polite student. If you were observing Celia's class, you would noticed she is the student with the biggest smile on her face, and she is always performance ready! Her smile brings joy to us as her teachers and we are so excited to watch her growth in dance class. Celia started off the year a little on the shy side, but after a month or two she really came out of her shell and became a star student in class. We can't wait to see her light up the stage at recital next month! Liliana is a member of our Mini Competition Team. In the beginning of the dance year she started out a little shy but very quickly found that dance was her passion and outlet to SHINE! She has transformed into quite the little sassy super star and is great at remembering choreography and giving her all in class. Liliana is as sassy as they come and is always having a fun time dancing in class. Liliana is one of the youngest members on the team but is confident in everything she does and couldn't wait to perform at her first competition. She makes her friends and teachers laugh everyday and is a joy to have in the studio. We are so happy to see her having fun in class and can't wait until her next performance! Olivia is a member of our Mini Competition Team. Even though it is her first year at TDF she is already progressing so much! Her teachers love her adorable sweet personality and even though she is sometimes a little shy in the studio she is a star on stage! We love seeing her in class every day and are so proud of how far she has come. We can't wait to see what the future holds for this mini dancer! Colleen is the newest member of our Petite Team! She is full of petite power and always performs with a huge smile on her face! She has worked so hard on her technique and is improving every day. Colleen is a fearless dancer who never shys away from a new learning opportunity and enjoys attending conventions and master classes whenever she can. We love her energy and enthusiasm for dance and love of learning. We can’t wait to see where this dancer’s love of dance takes her! Congratulations Colleen! This is Lauren's second year dancing at TDF. She is a very dedicated dancer, always asking her teachers what she can do on her own to help her continue improving. Lauren is very focused and quiet in class, but is an eye catching and dazzling performer on stage. We are so proud of Lauren's hard work and cannot wait to see her continue to grow here at TDF! We see a bright future for this young dancer! Audree is a member of our Advanced Mini Team this year and we are so proud of how far she has come! Her teachers love having her in class and her laughter is contagious! Audree is such a fun young dancer but is also very attentive and always remembers her choreography. She has become a leader among our minis and we can't wait to see her light up the stage this year at her first competition! This is Dylan's second year dancing TDF and his technique and flexibility have improved immensely over the past 2 years. His smile and laugh are contagious, making the studio a wonderful atmosphere for both his teachers and his peers. He has worked so hard over the past couple of years to improve his technique and his dedication has paid off! We are so proud of you and we can't wait to watch Dylan continue to grow and shine on stage this year. Sadie started dancing at The Dance Factory last year in hip hop class. 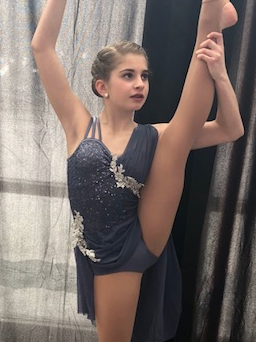 Now in her second year, she has decided to expand her dance knowledge and try ballet, tap, musical theatre and even joined our new Mini Competition Team! Her teachers have noticed not only her fun and creative personality but also her focus in learning new skills and determination to keep improving. Her work ethic and excitement in the studio display all the right ingredients to make a fabulous Dancer of the Month! She has learned so much in a few short weeks and we can't wait to see what else she will accomplish! This will be Madison's third year dancing with us. Madison dances with her friends in our Saturday morning KinderDance class. Madison was one of those pretty little girls in the memorable "What is your baking plan?" dance in this years recital. How cute were they? We are so happy to have her at our studio, and we look forward to continuing to watch her learn and grow. Emma is on our Elite Tween Hip Hop team and we are so proud of all her hard work here at TDF! Emma is always in class, working hard, and eager to learn new things. She pushes herself every class to become a better dancer and is always trying to go beyond her comfort zone. Although she is a tiny dancer she lights up the stage with her fun and bubbly personality! We can't wait to see her shine at recital and at our National Competition in June. This is Hazel's first year at TDF and we are so happy to have her with us! At first she was a little shy and quiet meeting new friends and adjusting to a new place but..... not anymore! Miss Hazel walks in every Saturday morning with a bigger than big smile and always has something silly to share with her class! 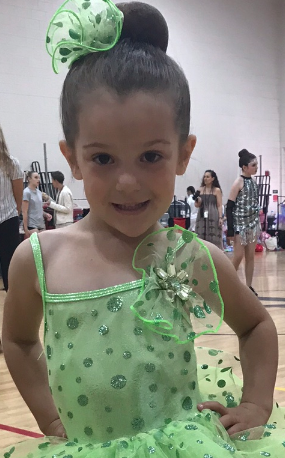 We cannot wait to see this little cutie light up the stage at recital! Melissa is a wonderful student who is eager to learn and is always listening and following instructions. Known by her classmates as Melissa Macaroni, a nickname that started in our first dance class back in September. She has a contagious smile, a heart of gold, and is always there to lend a helping hand! We cannot wait to see Melissa's hard work and passion for dance shine through as she steps on stage for recital! Kamryn has worked so hard this year on her ballet technique and has been thriving in her first year of tap! Her energy is contagious and you can't help but smile when you watch her dance. The kindness she shows to other dancers and her teachers is what makes her so special. We love watching this young performer grow up at the Dance Factory! ​Brianna is a great performer and the sweetest little dancer! Her teachers are so proud of all her hard work. She is a great listener and comes to dance ready to learn! We love teaching her and watching her grow up at the studio! Sadie has been working so hard this season! Sadie is a member of our Advanced Junior Competition Team and we are so proud of her. She is always working hard in her classes and is never afraid of a challenge. Sadie has been determined in all of her classes to improve her technique and she has come a long way this year. Her teachers love her energy and focus in class and her beautiful performance quality. Congrats to Sadie! Ainsley is a fantastic listener and brings a wonderful energy to the studio. Her positive attitude is contagious and she is always eager to learn and improve her dance training. Her teachers love having her in class and she is great role model for her peers. This is Ainsley's first year at the TDF and we are thrilled to be a part of her growth as a dancer. Congratulations to Ainsley! Mckenna is such a joy to have in class. She is always smiling and consistently focused week after week. Mckenna is a fantastic young leader and has a knack for remembering choreography. She has a strong work ethic and is a wonderful example to her peers. We can't wait to see Mckenna continue to grow at the studio! Congratulations to Mckenna! Talan is a member of our TDF Dance Company and is on our Advanced Mini Team! He is always working hard in class and has come such a long way in his dance training. Talan's flexibility and acro tricks have improved so much this past year and we love having him in class. 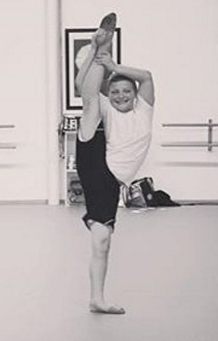 This dancer is one to watch and we can't wait to see him take the stage at competition! Ana is a member of our TDF Dance Company and is on our Advanced Junior Team this year. She is always working hard in class to improve her technique and is such a fun dancer to watch on stage! Her bubbly personality and great work ethic landed her as our featured dancer this month! Congratulations to Ana! Olivia Mack has been dancing at The Dance Factory for two years now and is such a treat to have in class! Olivia is mature beyond her years and it shows through her dancing. She is quite the performer and is extremely advanced for her age. She is always trying to improve in an out of the studio and her hard work is paying off! Congrats to Olivia! Brooke is well deserving of being dancer of the month, always coming to class ready to learn and grow as a dancer. This is Brooke's first year at the Dance Factory and is a star in the making! She lights up the room with her beautiful smile and fantastic attitude. Brookie should be so proud of herself! We can't wait to see where the years will take her! ﻿Congratulations﻿ to Cali & Bianca Barry! Cali and Bianca Barry are one cute power duo! They have both been dancing at the Dance Factory for two years and have come so far. These girls come to class ready to learn with a great attitude and strive to be the best they can be. Cali and Bianca light up the room with their big smiles and larger than life personalities. They are both STARS and we couldn't be more proud! Kate is a dancer in our mini program here at The Dance Factory! We love having Kate in class because she is such an enthusiastic dancer with great energy. Her smile can light up the room and watching her on stage is a delight! She is such a fun and positive dancer and we couldn't be more proud of you! Hailey has been part of the Dance Factory family for two years. She started out in our Creative Movement/Ballet class on Saturday mornings and this year she has added Tap. Hailey is always excited to be at the dance studio and she has an outstanding memory when it comes to learning choreography. She knows all of the lyrics to every "Frozen" song and is not a bit shy when it comes to the improv section of our class. Miss Julie is so happy to have her in class this year and cannot wait to watch her grow as a dancer and performer! Jessica is a member of our all new Advanced Mini Competition Team! She is a hard worker who is always paying attention in class. Her flexibility and acrobatic tricks have improved so much this past year! This little dancer is a beautiful performer and we can't wait to see her take the stage at competition! Emma is a member of our all new Advanced Mini Competition Team! We couldn't wait to have her in the studio more and the opportunity to train her. She had so many qualities that we look for in a competition team dancer. A positive attitude, enthusiastic approach to every class, good listening skills and the ability to take and apply corrections. Tayla is a member of our first ever mini competition team! She is a STAR! This one was born to DANCE! Tayla is such a talented young lady and has quite the future ahead of her, especially in dance. I enjoy the energy and attitude that she brings to the classroom. Come her senior year, she'll be unbelievable. This is Ella's third season with us at TDF. Ella lights up the room, the minute she enters the studio. I have plans for this little one and hope she will want to be a part of our competition team some day. Ella displays; excellent listening skills, a strong work ethic (she always practices her dances) and a positive attitude among her peers. All qualities we look for in our DOTM. If that little face doesn't say it all! This is Lily's second year with us a TDF, we look forward to having her for many more. This little Tutti Fruiti Cutie Patootie is Jazzy. This year Jasmyne got her splits! We are just as proud of her as she was all big smiles with her accomplishment. She has a superstar personality that shines when she dances. This little one LOVE 2 DANCE at TDF! The decision to choose Hanna as this months "DOTM" was easy. Last week while observing her during class. I could see how much she loved it! It was so rewarding as her teacher to watch her. Hanna is a member of our competition team. This is Emily's third year dancing with us. The friendships that she has made at the studio are just priceless. Every Tuesday I hear "EMILY" as all of her classmates line up to give her a big hug. There is no better sound in the world than the giggle of this happy little dancer and her friends. Alexandra has been chosen out of a select few to be a part of the studio's first mini dance competition team. Alex is a sweetie, always stops by the front desk to say hi. She is a leader, pays attention to detail and a talented young lady. Ellie is such a joy to have in class. She exemplifies all of the qualities I would like to see from all of my students. Ellie is a sweet girl and a beautiful, happy dancer. Nicole has been with The Dance Factory since we opened back in 2005. She quickly advanced through the program and increased her training. Nicole is now a member of our Junior Competition Team. She has competed with TDF at several competitions and won numerous awards. Nicole is thriving and is growing into a beautiful young lady and dancer. When Emmie first started dancing with us she was one of our Hip-Hop students. This year Emmie decided to take some technique classes. Not only is she thriving in ballet...her teachers have learned that Emmie has a beautiful voice. She is a shining star in her Glee class. Listen for her at our recital! Jerrianne was one of the first students to walk through the doors our first year to register for classes. I will always have the memory of Jerrianne "my skunk" she danced her role in "Animal Crackers" perfectly. She currently trains in ballet, jazz and tap. Jerrianne is a leader onstage and in the classroom. Lexi has been with me since the studio opened in 2005. She was part of our first father daughter performance. Lexi currently trains in ballet, jazz and tap. She is very hard working and focused. Her teachers love her giggle. 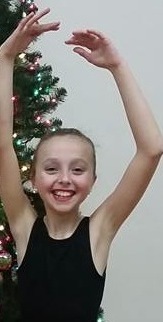 We know she is always having fun at DANCE! Carly is in her fourth year with The Dance Factory. We have selected Carly as our DOTM because of her listening skills. Carly is always respestful of her teachers, a good listener and does what is asked of her to the best of her ability. A quality we would like to see in a model student. Ava is in her second year with us. This little diva was one of our memorable dancers from "Itsy Bitsy Teenie Weenie". She is a doll and we adore her. Bella is in her second year of ballet at The Dance Factory. Bella was our first student to walk into our new studio to register for classes. She skips into the studio each week for dance with a big smile on her face. "Hi Miss Katie"